The time has come to announce Finding Fukuoka’s top ten yuru-kyara (character mascots for PR purposes) for 2013. The intense proliferation of these characters in every aspect of Japanese life has presented a plethora of amazing candidates for this list, and it has also made it much more difficult to choose just ten. In Japan, yuru-kyara are designed for just about anything you can think of — cities, prefectures, companies, brands, websites, projects, events, sports teams, products and more. This list is a ranking of my personal favorites, chosen from the thousands that exist throughout the country. I also list some special category award winners at the end. I have decided to exclude previous two-time winners such as Kumamon, Barii-san and others. I have also left Sento-kun off of the list this time around despite the fact that he is still the most creepy character in Japan. When footage was available, I have opted to use videos instead of photographs to give readers a better feel for how the characters move, sound, and look from different angles. Enjoy Finding Fukuoka’s top ten yuru-kyara picks for 2013! With the proliferation of yuru-kyara among nearly every company, local government and organization throughout Japan, it’s nice to see one with a truly handmade feel. This adorable fellow is the mascot for Usuki YEG (Young Entrepreneurs Group) located in Usuki City, Oita Prefecture (right here in Kyushu!). He supposedly lives together with his father, who is a kabosu (green citrus fruit that Usuki is known for), and his mother, who is a fugu (blowfish), which explains his name and appearance. Ton means pig and tan is a very casual and somewhat cutesy version of the honorific -san used when addressing people by name in Japanese. Ton-tan is easily one of the most adorable characters out there — his fuzzy outer layer makes you just want to pet him. According to his description, Ton-tan is very curious and enjoys searching for new things. Ton-tan is the character for the Ton × Tan information sharing website based out of Hokkaido. How great is Muki-Panda? He’s a panda character wearing the costume of a panda character, with a scarf (cape?) draped around it that makes him look superhero-eque in a way. Furthermore, he manages to stand out amid a flood of panda-type characters around the country. Muki-Panda is the self-appointed ambassador of tourism for Daisen-cho, a town in Tottori Prefecture (the source of some of Japan’s best yuru-kyara). This Niigata-based character is modeled after a real-life Austr0-Hungarian figure from the past, Theodor Edler von Lerch, who was said to be 270 cm (8.9 ft.) tall! People often said that once you got a look at old Lerch you never forgot him, and the same goes for Lerch-san! And the best part about Lerch-san? He actually skis (and snowboards), costume and all! Check out the video above of Lerch-san hitting the slopes. This pair of roly-poly characters was established to mark the 650th anniversary of the establishment of feudal government in Yamaguchi under the Ouchi clan. O-chan is a feudal lord and Ucchii is a princess, and both are designed to look like traditional dolls. The art of creating cute mascots has reached a level of near-perfection in Japan, and these two are some of the best yet. Admittedly, it’s tempting to give them a gentle push to see how far they will roll. This character is simply made of several tatami mats stuck together and, not surprisingly, he is the mascot for a Tatami shop in Kyoto Prefecture. The goal in creating this character was to spread the appeal of tatami mat flooring, the act of spending time in a traditional tea room with one’s family, and the general goodness of Japanese culture. Just like mascot #10 on this list, Tatamin-kun has sort of a thrown-together, made-at-home feel that is balanced out with cuteness and uniqueness, making him a top contender in this list. According to his description, Tatamin-kun is a “fairy” of the tatami mats. Chitchai Ossan’s official website gives him a fitting and adorable English name: Small Middle-aged Man. And that’s precisely what he is. Not only does his facial expression never fail to make onlookers burst into laughter, he exudes all the stereotypical qualities of an ossan (old men) in Japan, right down to the the silly (drunken?) grin, ring of hair and track pants. This Hyogo Prefecture character has a universal appeal that is quickly making him one of Japan’s most popular. There should be no reason to explain why Kiiboh ranks as one of the best characters in 2013. Just look at her! As I mentioned above, the art of cuteness in the field of yuru-kyara has reached an unprecedented high in recent years, and Kiiboh is easily one of the cutest around. Plus that look on her face would melt anyone’s heart. Kiiboh is the mascot for the Anjo Tanabata Festival in Aichi Prefecture: this star festival celebrates the legend of two lovers who are separated by the Milky Way and only allowed to meet once per year. This is a hard mascot to describe. It looks like a pudding monster and some green glass melted and then fused to a carpet, which was then draped over a regular person who decided to just keep walking around like that. Representing the Isesaki Monja Festival in Gunma Prefecture, Mojaroh is actually meant to look like Isesaki monja, a type monjayaki which, in case you are not familiar, basically looks like okonomiyaki that somebody barfed up. At any rate, that’s the story behind Mojaroh, one of the most hilarious characters in Japan today. Some of you may be familiar with Funasshii, the character that took a trip to London to ensure that not only Japan, but other countries as well, were sufficiently terrified of Funabashi City. Yes, Funasshii is one of the funniest, scariest, most unique, most twisted, and best yuru-kyara out there, and although she tends to appeal to a different audience than the legendary Kumamon, she may just steal his throne one day. Funasshii is a promotional mascot for Funabashi in Chiba Prefecture, and her uncontrollable convulsions, eerie jumping motions and high-pitched, desperately screeching voice tend to scare young children but make her popular among everyone else. During her trip to London (first video above), we see her screaming “I love you” to women in a passing convertible, yelling “fish and chips! Ya-hoo! !” as she eats, skipping down the street passed terrified pedestrians and convulsing uncontrollably on the grass in a park. No other character does it quite like Funasshii. This one gets recognition for its clever name and handmade feel, and also for helping to spread the yuru-kyara craze beyond Japanese borders. Saipanda is a panda from Saipan, hence the name. It was created to draw more tourists to the island. Gen-san is the mascot for Toyooka City, Hyogo Prefecture and also for San’in Kaigan Global Geopark. He is described as a stone mason who likes volcanoes. As shown in the video above, Gen-san was chosen as “most adventurous” because of his paragliding adventure, which honestly seems a bit dangerous for the person inside the costume. Hailing from Kochi Prefecture, Igosso (a word that means “stubborn person” in the local Tosa dialect) is the mascot for a hobby museum in the town of Shimanto-cho in Shikoku. There is no other yuru-kyara in Japan that looks like it hates to be at work more than Igosso, which is why he was chosen as most disgruntled. He is a mascot that carries a gun. Enough said. This thing looks like the spawn of Satan. Like something straight out of a Resident Evil game. Like a creature that logically should not exist, even in the world of fiction. This unfortunate half-canine is the mascot for a boat racing stadium in Nagoya, which is probably why he has been genetically engineered to be half fish. I’m not sure what the goal of creating such an awful character was, but it’s sure to result in more than a few bad dreams. Despite all the cute and goofy characters out there, creepy ones like this seem to pop up on ocassion. Okazaemon was created as an art PR mascot for Okazaki City, Aichi Prefecture. I’m hoping that the art in Okazaki looks a little better than this, because all I see when I look at Okazaemon is a suspicious, middle-aged man in creepy felt pajamas. His face is designed to look like the oka (岡) in Okazaki, and zaki (崎) is written on his chest. Check out the video of Okazaemon above to see just how eerie he looks when he…well, does just about anything. Okazaemon is creepy, but Muzumuzu is somehow worse. He represents Imizu City, Toyama Prefecture, and he is supposedly the king of the water spirits (hmm). The word muzumuzu usually indicates a creepy feeling, an itch to do something, or something irritating. That unfortunate and terrifying smile never leaves his face…the king gets what he wants. Mister Balls is exactly what he sounds like: a pair of balls. 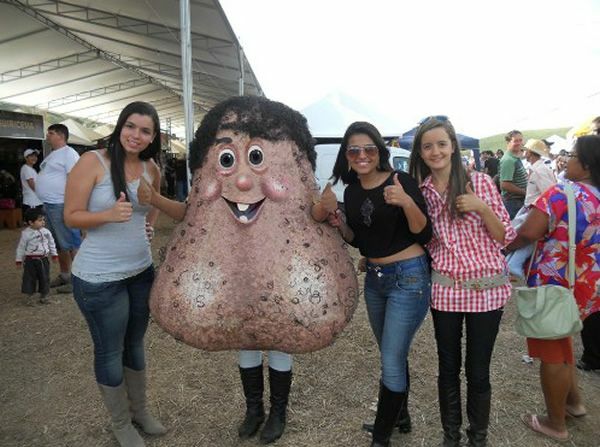 He was created to promote testicular cancer awareness and help promote relevant research, and his name over in Brazil is Senhor Testiculo (best name ever). He is apparently popular among women and children. The designers obviously paid attention to the small details, including his thick head of curly hair (eww). In all seriousness, this is an excellent example of how to use a character’s shock value to do good in the world — what better way to raise awareness? Click here to read more about Mister Balls. This entry was posted in History/Culture, Kyushu, Outside Kyushu and tagged 2013, balls, best, character, contest, creepiest, creepy, Fuk, Fukuoka, Funashi, Funasshi, Funasshii, funny, grand prix, Japan, Japanese, kumamon, kyara, Kyushu, mascot, ossan, popular, sento, top, top 10, top ten, unique, winner, worst, yuru. Bookmark the permalink.